My last visit to the city I walked around Soho for quite a few hours. 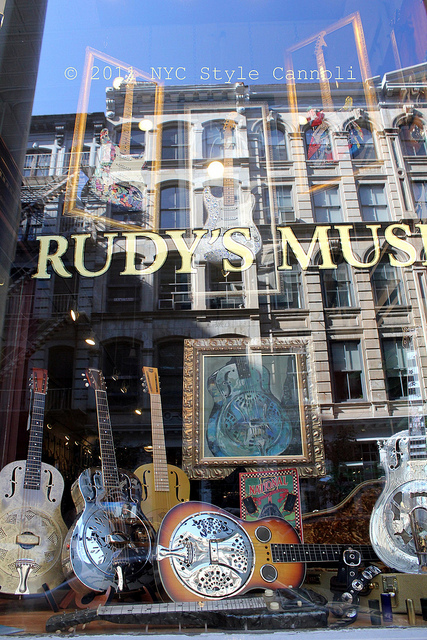 I came across Rudy's Music Shop which looked new to me so had to peek in the window. What gorgeous guitars did I find!! I do not play, my uncle was a musician, he played drums and sang. I didn't inherit any of that talent, I am afraid! The sun was really difficult this day but this one had all what looked like rhinestones on it! If I played I would probably want this one!! 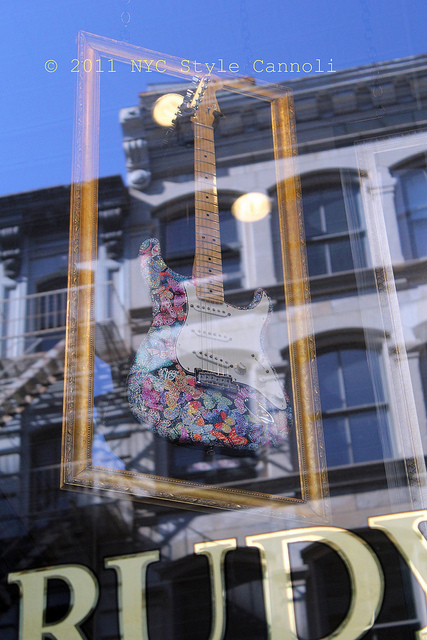 The shop is owned by Rudy Pensa and is newly opened on 461 Broome Street between Mercer and Greene Streets. He has had a shop in Times Square on 48th Street since 1978. This seems like "the" place to be for musicians and I can see them getting into alot of trouble here. Rudy has all types of guitars including vintage. Repairs are also available here as well. I looked up and saw the sign and thought ...how great of a sign is this??? This is a very classy music shop and if you have any interest in this, I would stop in. It would be well worth it !! This photo from Rudy's website without the sun glare!! 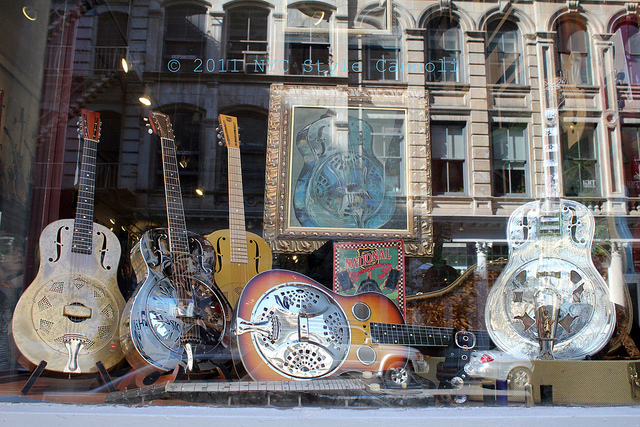 A cute little music shop with a great selection of guitars. Sounds like fun. I really loved the unique selection and like I say, cannot play the guitar at all! Just such a lovely little shop as Soho has many like these which makes it so special!! Your welcome Vanessa....glad to have you as my newest follower!! 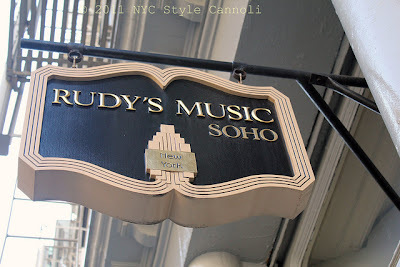 Rudy's is much more than a 'cute little music store' I'm afraid. It is the best and most famous among musicians. 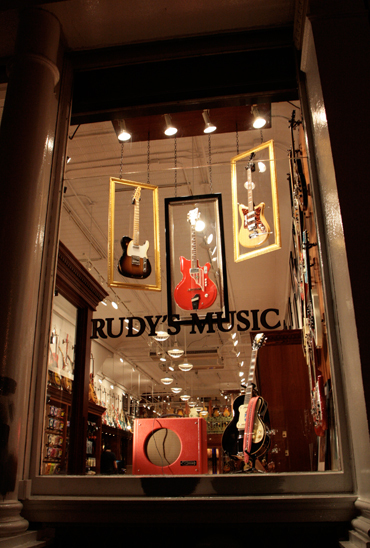 Rudy also has his own brand of guitars played by the likes of Mark Knopfler among many many others. Great service to bring the attention of your readers to this superb store! If you get to meet Rudy when you visit, you will be delighted. He is as charming, straightforward and "classy" as his store!